Identifying the required Social, Environmental and Economic interventions in a participatory mode tourism resource mapping. Establishing linkages to ensure local benefits through tourism. Social Responsibility initiatives: Ever since the RT cell was instituted at the four destinations, the program helped in bringing a major shift in the attitude of people towards tourism and increased their confidence that tourism activities in their places can bring in visible positive benefits. Following this, several initiatives that ensured participation of the host community, like comprehensive resource mapping, formulation of village life tour packages, and support programs to check child trafficking and other social and safety issues were taken up. Environmental: Initiatives taken up at the destinations helped the host community to perceive the importance of environmental conservation in improving quality of their lives and in sustaining the destination. Programs and projects included clean the destination campaign, plastic free zones, promotion of bicycle, antipollution drives and steps to improve environmental performance of tourism properties, and street light surveys that produced a visible change in the destinations. Economical: Economic linkages were established at destinations that helped the host community to identify revenue streams in tourism that they could tap using their skills, talents and produces. Resources like farming and agricultural produce, handicrafts, art and culture were utilized to derive economic benefits. In addition, activity groups were initiated at destinations to coordinate the production, procurement and supply of perishable and non – perishable commodities between the host community and the tourism industry. 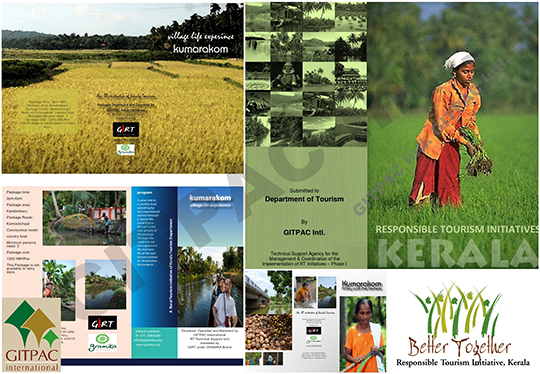 Under the technical support of GITPAC, Kerala Tourism has won the prestigious National Tourism Initiative in the country during the year 2008 – 09.